What do Snoopy and our little dog house have in common? PBS is in process of doing a documentary on Charles Schultz – the creator of Snoopy. They chose our dog house to use in this documentary to represent the dog house that may have inspired Charles to create and write about Snoopy. PBS staff visited us early May to film our dog house. We will be notified of an air date when it is available. See pictures below. 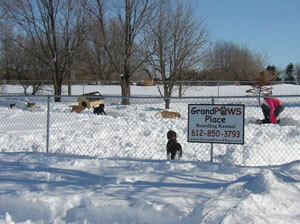 Reality Show Films at GrandPaws Place! Our claim to fame. 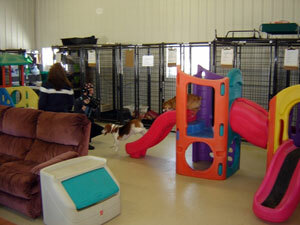 A Reality Show recently spent some time filming at our facility. The show “Honey We’re Killing the Kids” airs on TLC. It is about raising children, and the challenges that can come with it. Each episode is on a different family, this particular one being on a family from St Cloud. The Associate Producer wanted to do a show related to training dogs, and how the techniques a dog trainer uses can also be used in teaching your kids good habits. The crew flew in from New York and began filming. Kyle Mcabe (Director), Esther Stone (Associate Producer), and Maria Carrera (Production Assistant). The Episode aired on TLC August 30th 2007. Below are some pictures from our exciting day. The crew involved with the Reality Show Filming at GrandPaws Place. From Left to Right: Kristi Wang (GrandPaws Place Owner), Sara Bartlett (“Trainer”), Odie (dog), Heidi (mom the Reality Show episode in on), Kyle Mcabe (Director), Esther Stone (Associate Producer), Maria Carrera (Production Assistant). Kyle is helping Sara get hooked up with a microphone. Kyle is filming Sara working with Heidi, showing her techniques that can be used with her kids in trying to get them to help around the house. Sara asks Odie to put away his toys during this portion of filming – and YES – he does it! Kyle and Maria are filming dogs outside in the play yard. Kyle is filming some small dogs playing inside the facility.